The Learning Group on Social Norms and Gender-based Violence hosted a meeting in Baltimore, Maryland on the 14-15 June 2016. The group was launched by the Gender, Violence and Health Centre at the London School of Hygiene & Tropical Medicine (LSHTM). As part of the learning initiative, LSHTM convened an expert group meeting on the measurement of social norms sustaining GBV. The meeting focused on identifying best-practice strategies to diagnose and measure social norms. Social norm theory can only be used to change discriminatory gender practices if practitioners consider factors, other than norms, that work to sustain a given behaviour. Qualitative diagnosis of norms is crucial for designing successful interventions. Field experience demonstrates that existing strategies for measuring social norms are unnecessarily complex; quick and simple ways to measure norms do exist. Analysing social norms data requires disaggregation at the level of the reference group. Inappropriate aggregation of data can result in meaningless findings. 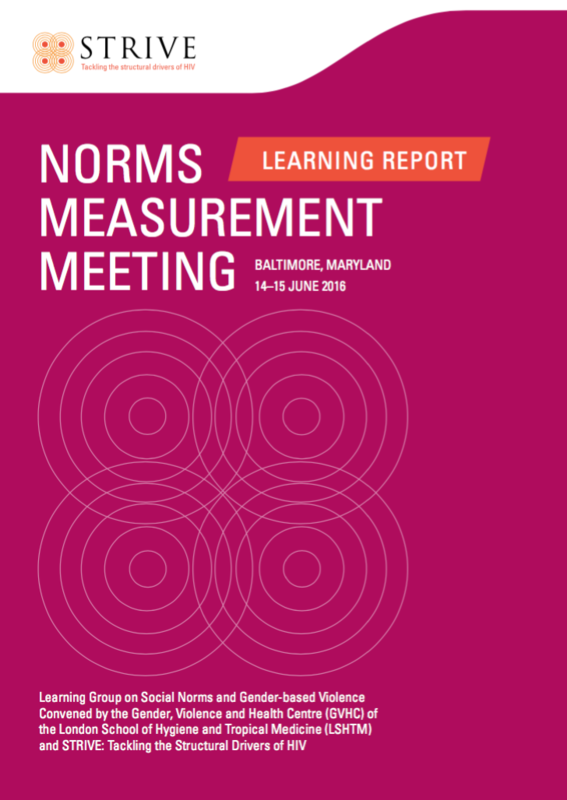 This learning report addresses the key challenges in social norms theory and proposes next steps based on the lessons learned and shared at the meeting. The social norms talking points from the meeting are available here.